I’ve been writing for years and one of the aspects of the craft I’ve usually enjoyed is researching necessary information for a story I want to tell. Years ago I started out writing historical romances. I love history and had a ball diving into different periods—like the Revolutionary War in America or Brazil in the 1800s or the French and Indian War in America in the southern part of the U.S.
Then a turn of events led to me writing contemporary romances. I did still have to do research from time to time about a profession or a locale, but it wasn’t as intense as a historical romance. Then about eleven years ago, I really found my home—romantic suspense. Now I’m constantly researching—besides a profession or a locale, also ways to murder someone, poisons, forensics, what to do at a crime scene, different crimes, etc. I could go on and on. I own tons of books on criminology and forensics. The key to researching is not to show all your research. 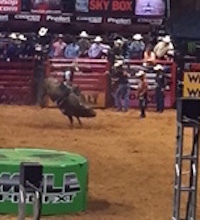 Recently I’ve been writing a romantic suspense with bull riding and rodeos as the backdrop. What was neat was the Professional Bull Riders had a rodeo in Tulsa where I live. I’d been to rodeos years ago but not with a writer’s eye. If only I had known then I was going to write about bull riding, I would have taken notes and pictures. This time I did both. But the absolute best thing I did in the name of research is going to the Writer’s Police Academy. This year was my second time—the other two years ago. Every class was full of information I can use in a book (or not—remember not all your research goes into the story or it would read as a non-fiction book). While at the police academy (in a real police academy with police, fire and paramedics training at the same time), I went through an investigation from beginning to end (even interviewing suspects who were role playing), fired a gun in a police simulator (this is not easy—I shot not only the bad guy but a bystander too), cleared a building looking for suspects and learned different things from what a SWAT team does to teaming with a police K-9. The pictures below are of me holding a SWAT team rifle (heavy), a SWAT team bulletproof vest (weighs 40 pounds!) and a K-9 apprehending a victim (role playing). Sometimes a writer can’t get to something like a Writer’s Police Academy, but if not, I would highly recommend doing a Citizen’s Police Academy as some local police departments will do. My dream is to go to the FBI Citizen’s Academy at Quantico where the Federal Bureau of Investigation train. What are some things you have done for research purposes? Did you have fun doing it? 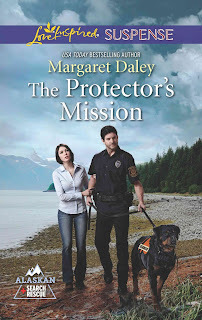 My most recent book is: The Protector’s Mission (in the Alaskan Search and Rescue series for Love Inspired Suspense). Lydia McKenzie is the only living witness to a serial bomber's latest threat. Surviving the explosion at the café, Lydia is rescued by police sergeant Jesse Hunt and his K-9 partner, a Rottweiler named Brutus. She's struggling to remember details of the incident. But one thing she'll never forget is how she once felt about Jesse—the high school sweetheart she left to marry another. In charge of her protection, the guarded cop believes the bomber's after her, and he promises to keep her safe. But as more of Lydia's memories return, the more the vicious killer wants her dead. Margaret, you look ready to roll with that gun and vest. At least I hit a target :), Mel. Merrillee, that gun was HEAVY. Yes, I love research too. If only they paid us to do that!